"AMAZING GYM, AWESOME COACHES & AN UNBEATABLE ATMOSPHERE & CULTURE!" Let us show you how to be fitter, faster, stronger ... AND have FUN whilst doing it! 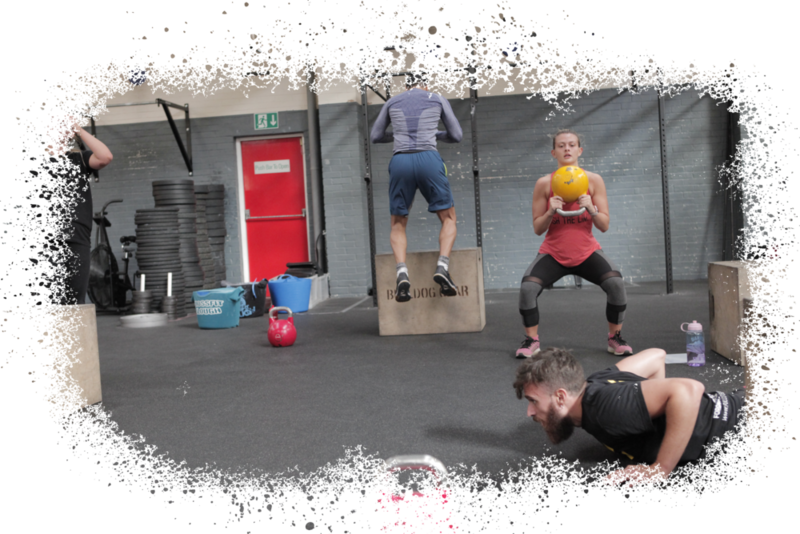 With a facility of over 4000sqft CrossFit Slough is one of the largest and well equipped facilities in South-East England. Check out our timetable which schedules over 180 classes a month - theres always time to train. This is easy... just click the link below to register your free trial class. Our welcoming and friendly members - this is the best bit! To accommodate all fitness levels and maintain your safety and confidence, we run three different levels of difficulty within each class. Your instructor will guide you on the most appropriate level to suit you. With every class you will meet our members and realise what a great bunch they are; supportive and always willing to lend a hand. You will no doubt make new friends forged in fitness! If you are new to CrossFit; as part of our Starter Package you will receive 2 x 1hr Personal Training (PT) sessions with one of our highly-experienced instructors. These sessions will provide you with 1:1 tuition to learn the Fundamental Movements of CrossFit and how to execute these in a safe way. The Starter Package will also provide you with unlimited classes for 30 days and a 4-week nutrition plan. Once you have purchased your Starter Package, we encourage all our new joiners to get stuck straight into classes and immerse themselves in our community and fitness programme. If you have already completed your Fundamentals at another CrossFit box, simply purchase one of our monthly memberships. Click button below. 3. Enjoy a new way of training! Classes are designed to develop the 10 physical principles of CrossFit; cardiovascular and respiratory endurance, strength, agility, balance, stamina, flexibility, coordination, accuracy, power and speed. Class numbers are capped at 14 to ensure maximum attention, guidance, safety and in turn results. Above all, our sense of community stands us apart from any other fitness facility. Don't take our word for it though - check out our reviews on Facebook and Google and come and trial a session for yourself! "Brilliant, motivating staff who push you to your limits and lovely members who don't judge you at all and both always say well done afterwards! Great atmosphere to be in"
"Great workout everytime. Once you start you will get hooked , which is a massive contrast to your standard mundane corporate gym. The atmosphere and energy is great .Everyone is very welcoming. Keep up the good work guys"
"Just did my 1st ever class. BEFORE - I thought it would be serious people, jargon filled, heavy weights and hard to get through. ACTUAL - Fun people, a nice gym atmosphere, a challenging and achievable workout. I was given an option to the exercises to me so I didn't feel like I was missing out. Highly recommend trying a class, you would be surprised how fun that hour was!" Learn how to CrossFit by attending a FREE trial in one our highly-supervised classes. (maximum of 14 members per instructor). Each class incorporates the 10 principles of Physical Fitness; cardiovascular endurance, strength, flexibility, agility, speed, balance, accuracy, power, coordination and stamina. Our CrossFit Kids and Teen programme welcomes kids between the ages of 6-16yrs. The classes are fun and engaging for all levels of ability. We have introduced our popular adult class alongside the CF Kids/Teens session to allow parents to train at the same time as our younger members. The ultimate time saver... or if you would prefer, relax and sit back with a coffee in our chillout area. Work on weaknesses, focus your training, make yourself accountable. If you are not quite ready to take the leap into group classes or feel you would like to focus on a particular goal - book a 1:1 or small group personal training session to achieve results. Focus on Cleans, Snatches and accessory work to improve explosive strength, balance, flexibility and power. 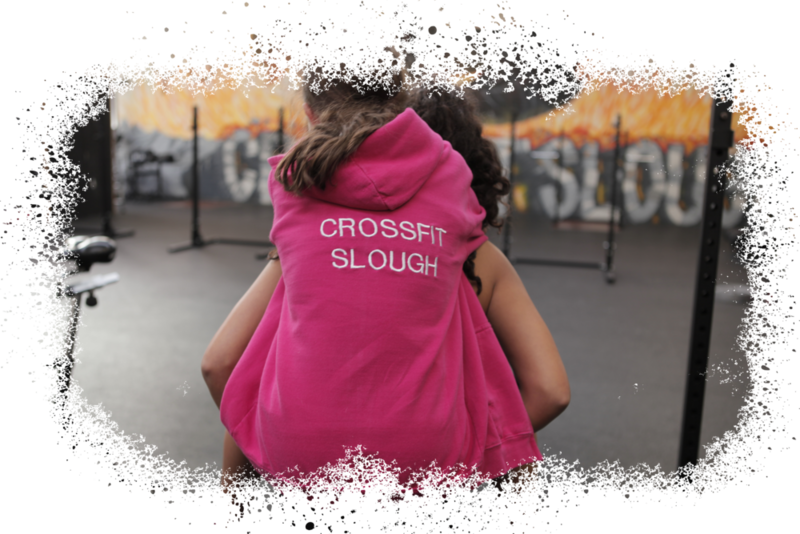 At CrossFit Slough we run specialist Olympic Lifting classes included in all of our monthly membership packages. CrossFit Slough has 4 lifting platforms, squat stands, barbells and bumper plates. Looking to improve your endurance, gymnastics, your flexibility or your core strength? CrossFit Slough runs weekly Gymnastics classes, included in the monthly membership packages. Learn to and improve upon your pull-ups, handstands, muscle-ups, L-sits and more! With the luxury of space at our premium 4000sqft facility, we have a large open gym suite available for members to use alongside timetabled classes. This is perfect for members working on skills, performing olympic lifts or simply stretching and improving their mobility. Our facility is one of the largest in the London area, located in the heart of Slough Trading Estate which is home to companies such as Mars, Telefonica, O2, Fiat, LG and Ferrari. We are located by Junction 6 of the M4, which is easily commutable from Windsor, Eton, Stoke Poges, Gerrards Cross, Uxbridge, Denham, Iver, Burnham, Fulmer and High Wycombe.